This is THE seasonal I anxiously await each year. A traditional Märzen style beer, that has a rich malty flavor and is moderately hopped. Despite what Heineken, Becks and Budweiser will have you believe, Märzen is the traditional beer for Oktoberfest, hence the name. For me, it’s deep orange color and malty flavor have been become as emblematic to fall, as pumpkins, Halloween and bad campaign ads. In years past, the Sam Adams Octoberfest had notes of caramel that are sadly lacking in this years batch. I am hoping that as the weather cools and the beer spends more time conditioning, the caramel notes will become more prominent. 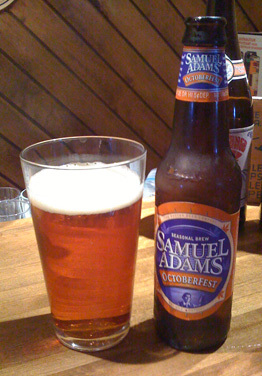 Overall, Octoberfest remains my favorite seasonal from Sam Adams, with their Winter Ale coming in a close second. I haven’t decided whether or not to rate the beers I review by some convoluted scale or rating system. Would it be helpful to you, the reader? For now, with this beer at least, I am going to sum things up by saying this is a beer you should seek out and enjoy. However, you should be warned: this beer will only be around until sometime after Halloween. If you enjoy it as much as I do, you’ll spend nine months of every year counting the days until it’s delicious return. I *almost* picked that up last week. So close. Picked up a Samuel Smith's Nut Brown Ale instead. I just picked up a six pack about fifteen minutes ago, I am now waiting for it to become perfectly chilled. 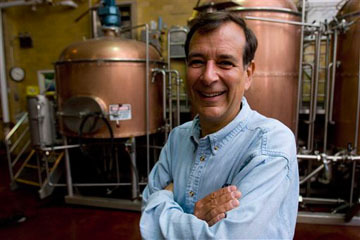 I doubt that it will be as good as your home brew though, Sir Matt Brewmaster Anthony. BTW you should legally change your name to that. I will even draft the legal documents for free... Okay maybe a six pack.